Fun. Friendly. Free. Those are three words that can easily sum up the North Valley Vintage Touring Club's 3rd Annual Volcano 200 this coming weekend, August 4th. 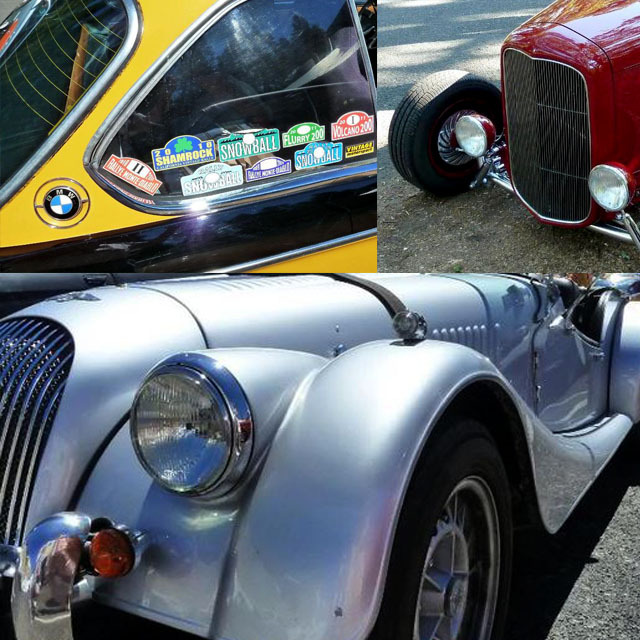 Now in it's junior year, the club founders have developed a mid-summer tour that brings together the camaraderie of classic car owners for all makes and models of pre-1980 cars and motorcycles. This event is a one-day cruise to (and through) the scenic Lassen Volcanic National Park in Northern California. You can expect to enjoy some of the best driving roads in the region with an eclectic group of cars. Past events saw the likes of Triumphs, Morgans, BMWs, Corvettes, '32 Ford hotrods and Volvos to name a few. The organizers are stand-up guys and do a good job of putting on a low key and friendly event. In fact, we met one of the founders roughly four years ago when he was contemplating selling his BMW 2002. He ended up holding on to it and now exercises it on the Volcano 200 along with some of his BMW Neue Klasse cars. Above is a scouting picture (last month) of one of the roads. Below are the event details taken from the North Valley Vintage Touring Club Facebook page. We depart from Beatnicks Coffeehouse in Chico at 8:00am. Heading north, taking various backroads (with a stop or two)to Shingletown. After a break in Shingletown to pick up drivers from Redding, we head east to tour through beautiful Lassen Park. A favorite stop in the park is the summit trail parking lot where we regroup for photos, tall tales and tire kicking. A few miles after exiting the park, we stop at Mill Creek resort for lunch and refreshment. After lunch, there is the option for those that live north to head down Hwy 36 and others continue on and down Hwy 32 into Chico. Many continue onto Chico and meet for a final stop at Sierra Nevada Brewery. There is no cost to the event. There is a $10 entrance fee to Lassen Volcanic National Park. There will be a limited number of free rally/map books and rally stickers. T-shirts will be for sale, and the artwork by Shannon this year is awesome! Donations to offset printing costs are gladly accepted, but not required for participation. Good coffee and a great place for breakfast. Please arrive early (7ish) if you plan to enjoy breakfast. Arriving and ordering food at 7:45 isn't going to work as we do need to meet the Redding drivers within a reasonable time frame. Please arrive with a full tank. There is a Valero gas station right around the corner from Beatnicks. Don't let the address fool you, it's located right on HWY 44. Coming from Redding, it's on the left hand side directly across from the Shingletown City Limit/Population Sign. Gas is available here. Depending on the turnout, lunch at Mill Creek can take some time. Some folks pack a lunch and enjoy a picnic in beautiful Lassen Park. There are picnic areas at Mill Creek Resort. It's also a (very) small store so snacks and drinks are available. Lunch Stop. Mill Creek Resort DOES NOT take plastic. If you plan to eat, bring cash. Beer is served as well. Check Them out on Facebook for photos from the last two years and any updates.